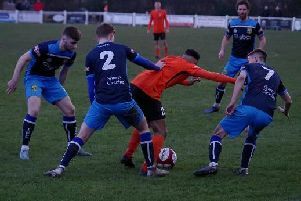 Tadcaster Albion became the first side to lose to bottom of the table Burscough this season when they suffered a 2-1 defeat on Merseyside on Saturday. Despite the Brewers dominating the match, two stunning Conor Smith strikes and an inspired goalkeeping performance from Marcus Burgess left Billy Miller’s men bemused. It all started so well for Albion as referee George Warren pointed to the penalty spot after just six minutes when Adam Baker was hauled down by Reece McNally. Top-scorer Tom Corner stepped up and coolly netted his eighth goal of the campaign. Taddy have been in this situation many a time this season but have just been unable to make their dominance count and put daylight between themselves and their opposition. This was very much the case once again on a bitter afternoon in Burscough. Charlie Binns came close to doubling the lead in the 14th minute when he saw his miscued volley deflected just wide by gloveman Burgess. Despite the Brewers being in complete control, the home side drew level out of nowhere in the 27th minute. Jason Mycoe initially hooked Mason Nevitt’s dink off the line after goalkeeper Gary Stevens fumbled the ball on the edge of the area, but there was no stopping Smith’s fine strike from distance which flew into the top corner. The Burscough equaliser didn’t change the flow of the game however as Miller’s troops continued to dominate possession and probe for more goals as Josh Barrett glanced a Jono Greening free-kick inches wide. The second half started in similar fashion with the travelling team looking to force the issue as they went in search of their first win since October 15. Conor Sellars attempted to take matters into his own hands and almost snatched the lead back after some positive combination play with Jono Greening led to the former Middlesbrough man forcing Burgess to save at full-stretch. The aforementioned Burgess was to steal the show – along with Smith – in the second half, keeping the Brewers out on several occasions from improbable positions. Some good full-back play from Josh Grant gave Baker not one, but two chances to try and power beyond Burgess, but the on-loan stopper pulled off a remarkable double save. The team in green were certainly still posing a threat on the break as Taddy pushed bodies forward and they came a whisker away from taking the lead themselves when Smith struck the inside of the upright. Binns, starting for the first time in several weeks, threatened to beat the inspired Burgess with two headers, but the first drifted narrowly over and the second was deflected wide. The introduction of Josh Greening by manager Miller almost had an immediate impact, but once again, as the striker ran clear down an inside left position, his low drive was terrifically saved by Burgess. As the match entered the last 10 minutes, the kitchen sink and all apparatus that can be imagined were being thrown by Albion. The two best chances came in the final couple of minutes. Firstly, Binns fired across the face of goal but the ball bypassed Andy Milne and Rob Youhill in the six-yard box before Corner slid agonisingly wide of the left-hand upright from close range. And with one minute of normal time remaining, Burgess saved his best until last. Grant’s raking diagonal ball into the box was flicked down by Dan Thirkell to an unmarked Rob Youhill five yards out. The latter’s header looked to set to win the game for the visitors, but Burgess somehow flung a hand up to his right to magnificently tip over the crossbar from point-blank range. Taddy were then left in sheer disbelief as their struggling Burscough pinched all three points in the 93rd minute. Just as Burgess had outdone himself, midfielder Smith did the same as unbelievably he bettered his first goal by sending an absolute rocket into the top left-hand corner from at least 30 yards out.